The New York Times reports on the recent phenomenon of "comparative advertising": aggressive ads wherein brands attack their competitors by name. It's the Pepsi Challenge all over again, but with soup and coffee instead of two near-indistinguishable colas. 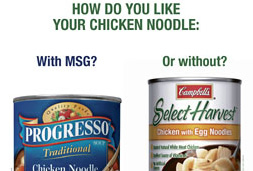 The Campbell Soup Company is calling out Progresso chicken noodle soup for having MSG, and Dunkin' Donuts is promoting a taste test claiming the respondents preferred their coffee over Starbucks. Does no one remember the epic Sarah Michelle Gellar-gate of 1983? The micro-starlet called out McDonalds by name in a television commercial for Burger King, and got named personally in the lawsuit! And she couldn't go into a McDonald's unless she was in disguise! Think of the children!